I happened to bring a camera that weekend to take bird pictures. 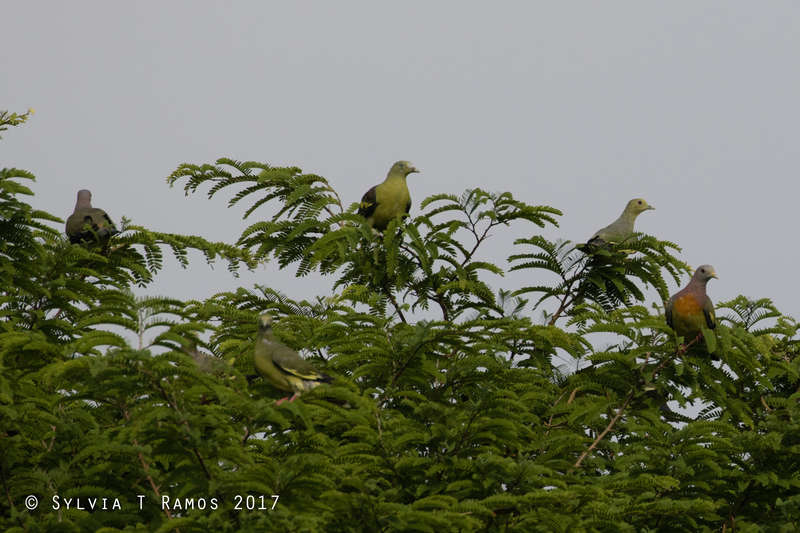 When I looked at my photos, I was surprised to see a Philippine Green Pigeon mixed in with the flock of Pink-necked Green Pigeons! 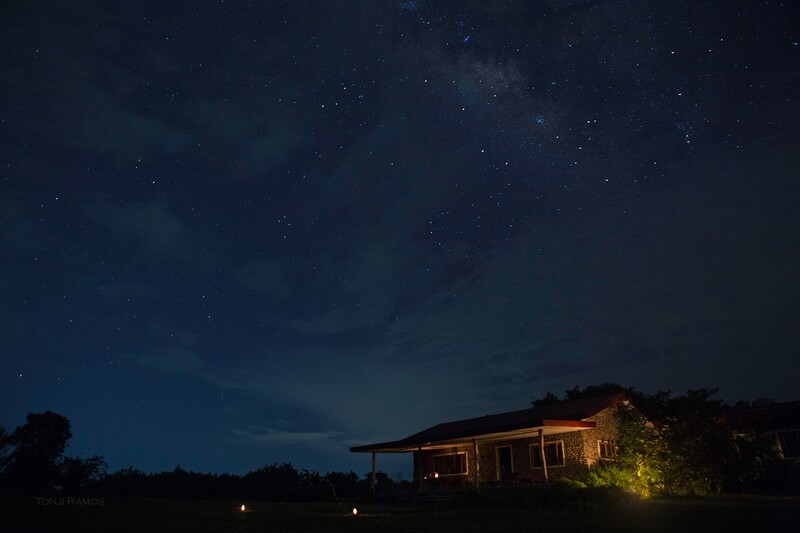 It was also the weekend of the Perseids meteor shower. The peak of the meteor shower, when you could view up to 50 meteors an hour, was supposed to be late evening up to early morning. 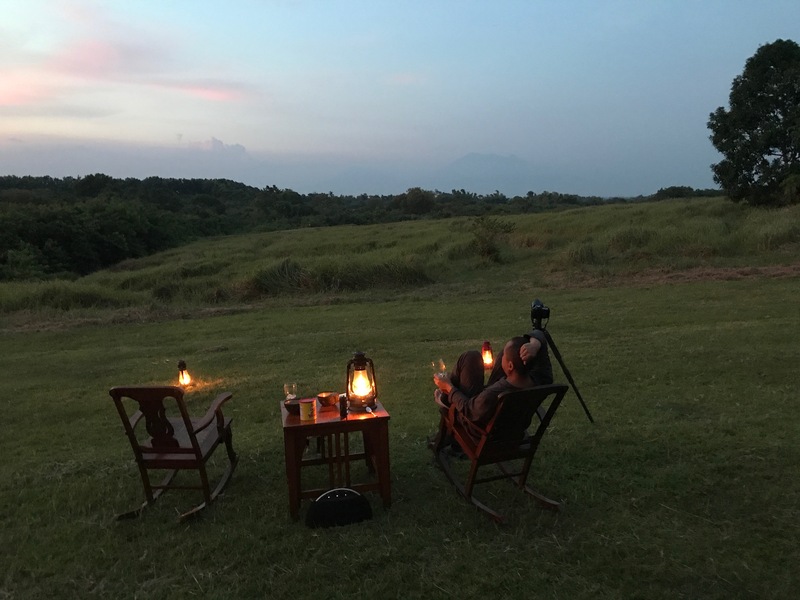 We set up early knowing that farm nights usually end very early for us! We had cold drinks, snacks, and a mat for Momo and Barkley. Bats danced overhead. Soon there were firelies around us and owls calling. When it was dark a Grass Owl perched on the bamboo fence in front of us. I peered up at the sky through binoculars. The stars were beautiful and endless! Then one star would start moving and I would follow it with the binoculars! There was only a short window of time when the skies were clear. Later that evening, the skies in the north eastern part of the sky were covered in clouds. Behind us there were still clear skies and even more stars. If you look closely at the photo, you can see a firefly coming in to land beside the lamp near the house. Beautiful shot of your cottage! I think I do see the firefly on your porch but I can’t enlarge the photo to be sure. The blue indigo sky on this starry night is gorgeous! BTW, how do you keep mosquitoes from eating you alive at night? Thanks Arlene! Photo credits to my husband! I will adjust the setting of the photo so it’s clickable and will come out full size. About mosquitoes — I am one of those person that gets bitten all the time and I get an allergic reaction! I wear pants at night and spray with a natural mosquito repellant spray (Messy Bessy brand). When it’s windy, I don’t get bothered by mosquitoes. Thanks! I will look at that photo again. I will try Messy Bessy too. BTW, where you somewhere today photographing the Solar Eclipse? Cecile saw it at 100% totality and Rinah in Washington saw it at 96%. Here in DC, we got to see it at 82% but still spectacular. Welcome to my world. So happy for you. Thanks! So much joy from having this spot on earth.